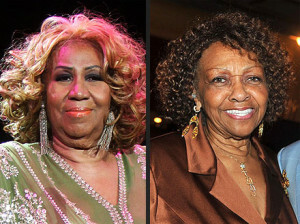 Legendary singer Aretha Franklin will return to her Gospel roots to perform at the 30th Annual McDonald’s Gospelfest on Saturday May 11, 2013 at the Prudential Center (165 Mulberry Street, Newark, NJ). Aretha began her personal musical journey singing at her much-revered father Reverend C.L. Franklin’s New Bethel Baptist Church at a very young age. She was unquestionably influenced by the presence of such gospel luminaries as Clara Ward, Mahalia Jackson and the Reverend James Cleveland. Her ever-distinctive soulful, to-the-bone vocal style has graced the music charts for over four decades and while her ‘live’ performances have touched the hearts of literally millions since she began her musical journey as a gospel-singing child prodigy, it is her rich legacy of recordings that are a testament to the power, majesty and genius of this one-of-a-kind artist of the first order. Aretha Franklin joins great Gospel headliners Donnie McClurkin, Hezekiah Walker, and Cissy Houston. There will also be a powerful preached word by Bishop T.D. Jakes. Produced and directed by Emmy Award winning Producer, A. Curtis Farrow, McDonald’s Gospelfest is a celebration of Gospel music and all disciplines. Rising stars of all colors, ages, cultures and faiths will compete in a variety of categories including Soloists, Youth Choir, Adult Choir, Praise Dance, Step, Singing Groups, Gospel Comedians, Gospel Poets and Gospel Rappers. Tickets can be purchased at the Prudential Center Box Office or through Ticketmaster by calling 800.745.3000, or at www.ticketmaster.com. For further information, please call the McDonald’s Gospelfest Hotline at 973.643.6262. Competition will begin at 3pm; the headliner performance will begin at 6pm. McDonald’s Gospelfest originated in 1983 under the auspices of the McDonald’s Corporation and the McDonald’s Tri-State Owner/Operator Association. Thirty years later, it has emerged as the nation’s preeminent Gospel celebration, bringing joy, inspiration, encouragement and hope to millions of Americans. Previous McDonald’s Gospelfest participants have gone on to successful careers in entertainment, including the renowned Bishop Hezekiah Walker. This entry was posted in Gospel and tagged 2013, Aretha Franklin, Cissy Houston, McDonald’s Gospelfest by Kris Patrick. Bookmark the permalink.